SELMA, NC – Built in 2002, the Selma Baptist Church in Selma, NC was originally constructed to accommodate 500 members with the original sound system planned for an upgrade in 2018. 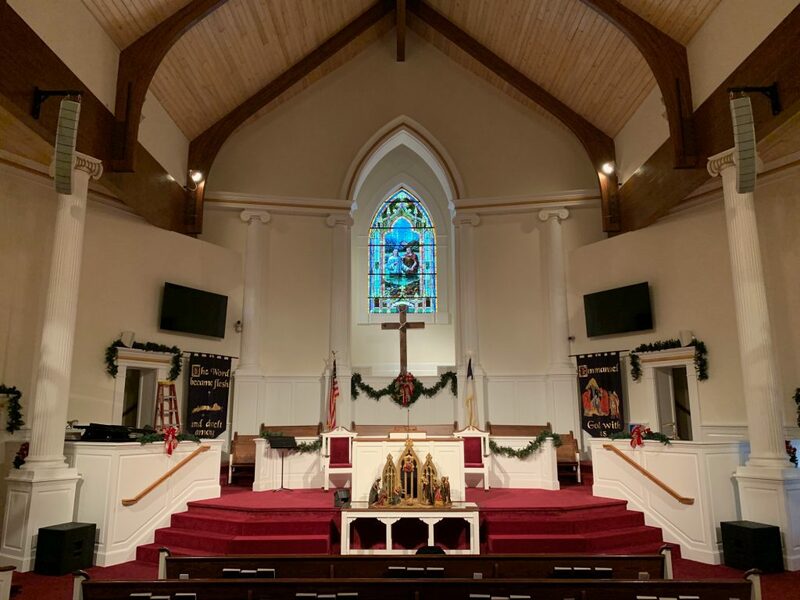 Seeking a system that would provide highly articulated intelligible speech for all attendees, the church opted for Martin Audio O-Line provided by RMB Audio of Raleigh, NC. RMB’s Matt Johnson headed the design team and his expertise with a wide variety of Martin Audio products was key to making the best recommendation for the church. While conducting the initial site survey, Matt listened to the existing sound system, laser-measured the room and spoke with a representative from the church to understand their concerns. Beyond achieving the optimal clarity of speech in the sanctuary, it was requested that the sound system be as visually unobtrusive as possible. Preserving the clean lines of the 45 ft. peak ceiling while covering the single balcony, choir loft and orchestra seating proved to be the deciding factor in recommending the Martin Audio O-Line as an audio solution. The small “pencil like” arrays would blend into the sight lines and not become a distraction from the church’s architecture. Inputting the room dimensions into Martin Audio Display software allowed Matt to simulate varying numbers of O-Line cabinets, amplifier resolutions and placements before the installation. This was particularly useful in determining the optimal balance of audio performance given the church’s sanctuary and budget guidelines. He determined that two arrays, each consisting of 12 Martin Audio O-Line cabinets supplied the best balance of performance for cost. The accuracy of the software model was verified to be consistent with the measurements taken after the O-Line was installed. The Martin O-Line array provides a high level of resolution from the first to the back row of the orchestra up to the balcony seating above. Each O-Line cabinet contains five 0.55” closely grouped high frequency dome tweeters drivers and two 3.5” woofer pistons flush mounted in a cabinet horn flare shared with the high frequency elements. 12 O-Line cabinets weigh 95 lbs. with a column length of 54 inches. Additional under balcony speakers were added to improve intelligibility to obstructed seats. Two Martin Audio Blackline X115 subs were added to complete the system. O-Line’s ability to reproduce very high frequencies without sidelobes makes it the ideal solution for both full-range speech and music reproduction in reverberant spaces. Two Martin Audio CDD6 cabinets were installed in the choir loft to provide consistent coverage on stage. The CDD6 is 120 degrees wide in close proximity and then reduces to 70 degrees for further distant coverage.